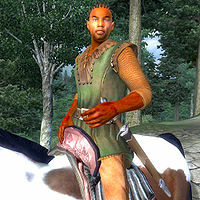 Lathon is a Redguard knight added by the Knights of the Nine official plug-in. Before Lathon is knighted he will wear leather boots, tan linens, a forester's shirt, and either a pair of leather boots or a pair of pigskin shoes. In combat he will use a steel shortsword. At night, or when it's dark he will carry a torch to light his path. He carries four leveled restore health potions and a moderate amount of gold. If spoken to before joining the Knights of the Nine, he will tell you of his service to Sir Roderic, and his desire to return to Totambu and join the Knights of the Scarab. After he joins the Knights of the Nine his armor is replaced by the standard Knights of the Nine outfit: a Knights of the Nine cuirass and shield, chainmail greaves, gauntlets, helmet and boots. He is then armed with a leveled longsword and bow with silver arrows. He is the squire of Sir Roderic and can be found at first on the road with him completing their Pilgrimage. After the Priory of the Nine quest is completed, he appears at the Priory of the Nine, where he reveals some plot points and gives you the Greaves of the Crusader for the quest The Faithful Squire, and requests to become a Knight of the Nine. Once he is a knight his name becomes Sir Lathon. Lathon rides a Paint Horse that can be found in the Priory's stables after Lathon has arrived. Unlike the other two horses in the Priory's stables, riding Lathon's horse is considered to be stealing, since the horse is owned by Lathon. Lathon joins the Knights of the Nine faction after arriving at the Priory. This page was last modified on 15 October 2018, at 22:13.